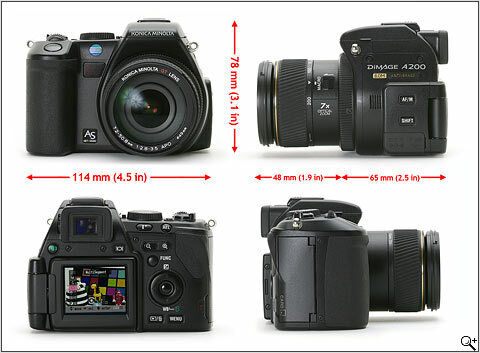 Although it's an entirely new body, the A200 bears more strong family resemblance to the A2, A1 and the previous generation models they were based on (the DiMAGE 5 and 7). A closer look, however, reveals some pretty significant changes. For one thing the new model is smaller and lighter (thanks to its all-plastic body), and the overall design has been given a less aggressive, curvier treatment, whilst remaining firmly in the 'SLR-like' camp. The external controls have been simplified and the LCD screen now swings out through 90 degrees and pivots through a full 270 degrees, and can be stowed screen-side in when you're not using it. 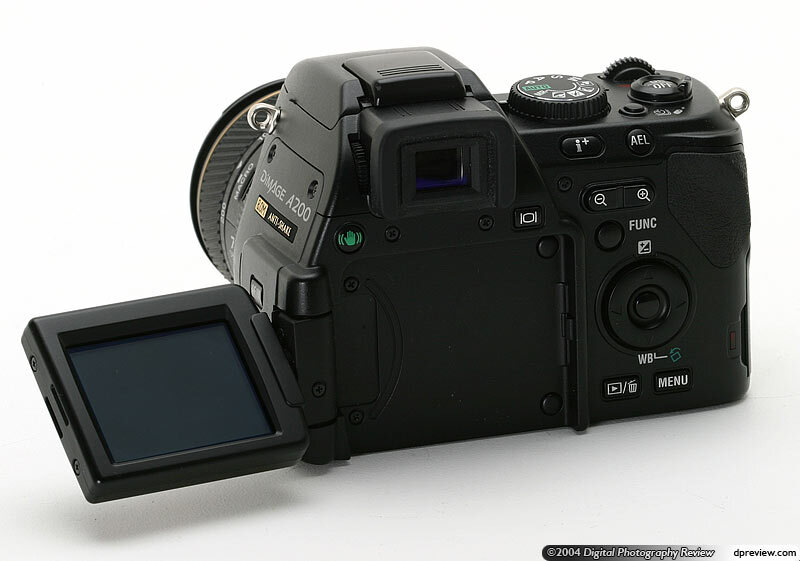 The top plate LCD panel has disappeared entirely, with the main mode dial sliding over to next to the flash. 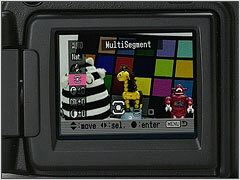 Most of the controls on the right side of the camera (looking from the front) have also disappeared, their functions now grouped together in a Canon-like FUNC menu or, in the case of drive mode and white balance, getting their own buttons. The electronic viewfinder (EVF) is less obtrusive than the A1/A2 finder - mainly because it doesn't tilt upwards any more. 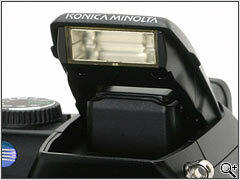 The lens unit appears to be identical. 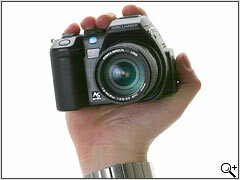 The DiMAGE A200 has a fairly deep and comfortable hand grip which has a nice soft rubber coating. It's perfectly designed for single-handed operation (I actually think it's a tiny improvement on the superb ergonomics of the A2) and feels incredibly safe and stable in your hand (it may be lighter than the A2, but this is no featherweight!). Around the back of the camera is a small molded 'hook' which is placed perfectly for your thumb. The battery and grip are perfectly balanced. 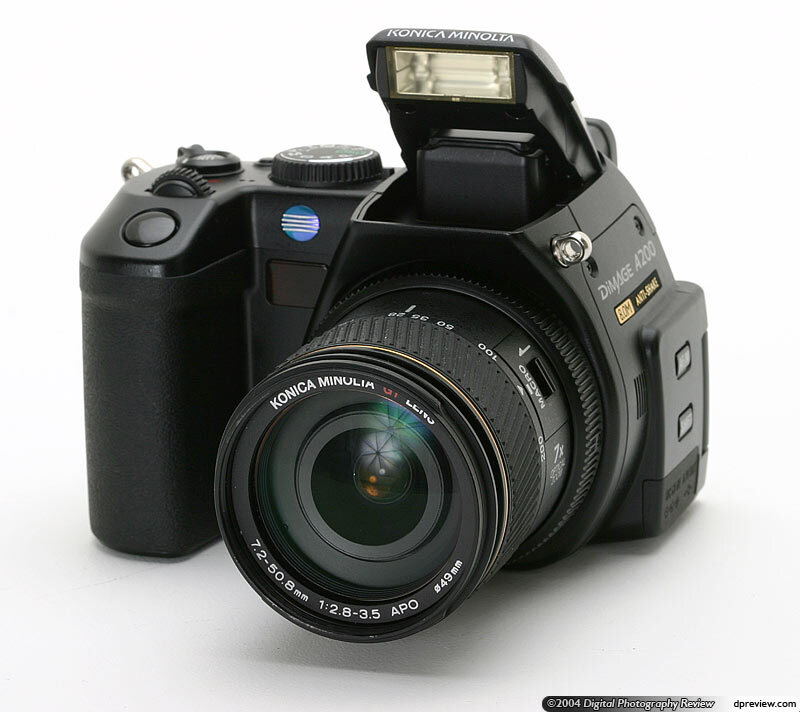 This is a nice camera to use. Here for comparison are the DiMAGE A200 flanked by the considerably bulkier Panasonic DMC-FZ20 and the marginally smaller Fujifilm FinePix 5100. The A200, like the A2 before it, sits towards the lower end of the current crop of 8MP cameras in size terms (only the Nikon Coolpix 8700 and Canon PowerShot Pro 1 being smaller), and only the Nikon 8700 is lighter. The A200 is powered by a single NP-800 Li-Ion rechargeable battery (7.4V, 800mAh) which fits inside the hand grip. The battery compartment door is held closed by a small latch, once open the battery stays in place thanks to a second spring loaded latch. The battery life is nowhere near as good as the A2 (in the cold UK winter we managed about 200 shots using the LCD), but spare batteries are available for under $20. 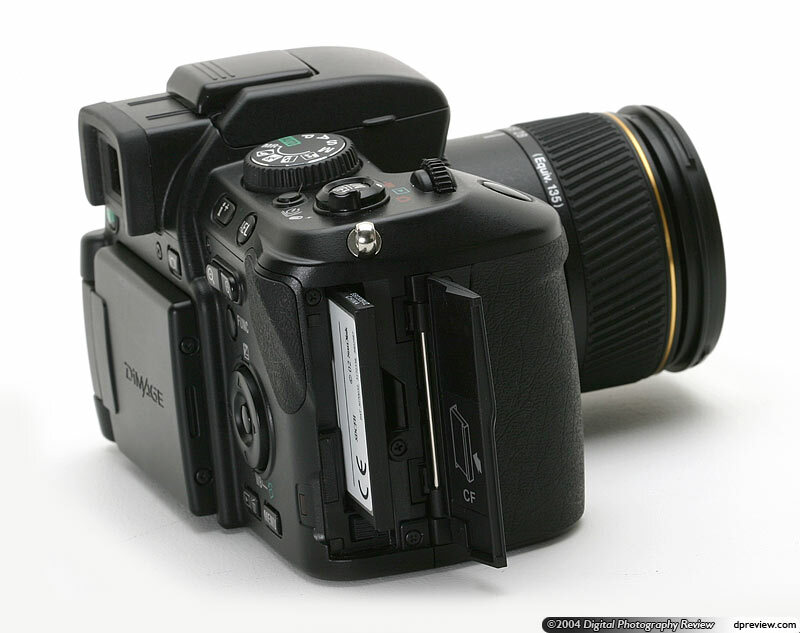 The battery appear to be the same as a Nikon EN EL1. The CompactFlash compartment is located in the side of the hand grip, the door has a spring loaded hinge mechanism which holds it closed. 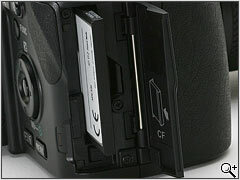 The DiMAGE A200 supports both CompactFlash Type I and Type II including the IBM Microdrive, it also supports the FAT32 file system which means that it can use cards with a capacity greater than 2GB. The A200 has just two connection ports (the remote control socket now unnecessary as a wireless remote is included, the flash sync socket simply left off the camera). 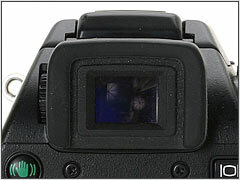 The DC-in and combined USB 2.0/AV out port are hidden under a rubber flap at the bottom of the right hand side of the camera (as viewed from the front). 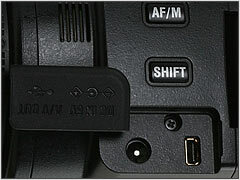 The DiMAGE A2 has a manual pop-up flash which is opened by pushing it upwards from its spring-loaded closed position. This automatically enables flash mode and starts charging. The flash is rated as having a range of Wide: 0.5 -3.8m (1.6 - 12.5 ft); Tele: 0.5– 3.0 m (1.6– 9.8 ft) (Auto ISO). 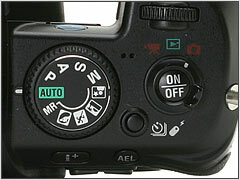 Unlike the A2, there is an auto flash mode, so the flash can be left up and the camera allowed to decide whether to fire. 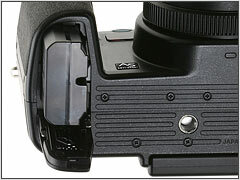 A hot shoe allows the attachment of an external (Dynax/Maxxum fit) flashgun. The A200's flip-out and twist LCD screen is bright, and very clear. It also has a very high refresh rate, meaning there's no visible lag. The anti-reflective coating seems to work well in even very bright light (well as near as we get to bright light in the UK in January! ), and gains up well in low light too. The LCD is actually slightly higher resolution than the A2 (134,000 pixels as opposed to 113,000), and the difference really shows. Of course, the most significant difference is the inclusion of a 'swing- out and pivot' mechanism for the color screen. 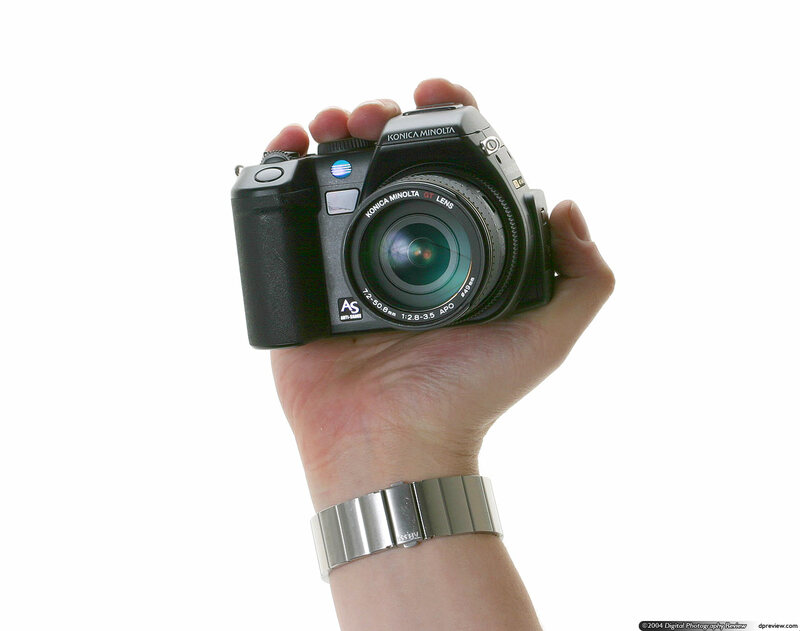 It works just like a Coolpix or PowerShot and adds considerably to shooting versatility. The screen swings out on a hinge to 180 degrees, and tilts through 270 degrees, allowing shooting from virtually any angle. One of the most praised parts of the DiMAGE A2 - the ultra high resolution electronic viewfinder - has been sacrificed to keep the A200's cost down. With a quarter the resolution (320 x 240 pixels) you won't be surprised to hear the A200's EVF pales in comparison to the A2's, but that's not to say it isn't perfectly usable. In fact, compared to most of the competition it is bright, clear and lag-free. Not bad at all in fact. 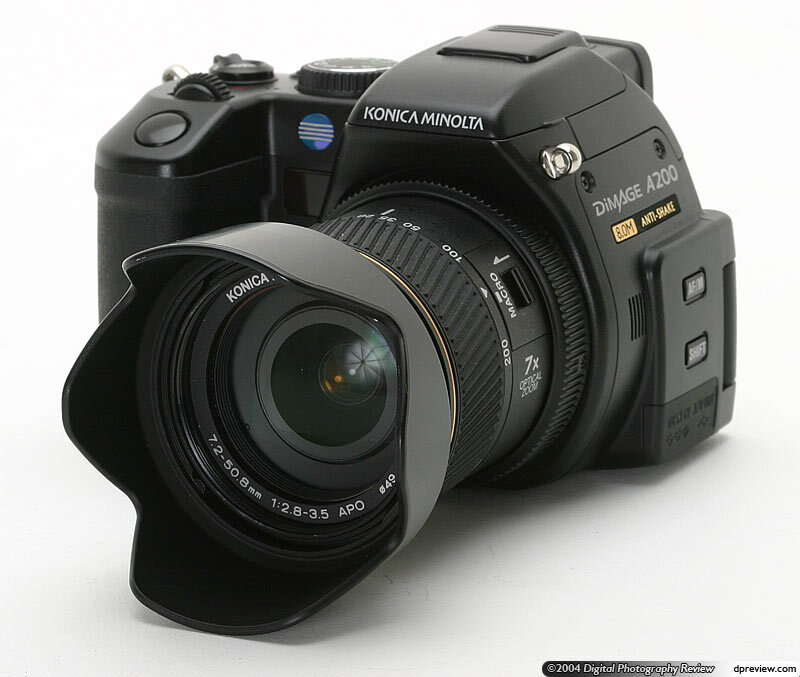 The DiMAGE A200 has the same 28-200mm (equiv.) zoom as its predecessor(s), and shares all its positive attributes; useful range from true wideangle to decent telephoto, superb mechanically-linked zoom mechanism (you turn the barrel to zoom), for faster, more accurate zooming, and a very nice and bright F2.8-3.5 maximum aperture. The mechanical zoom is still a joy to use, and the nearest you'll get to using an SLR without actually owning one. Carrying on the 'SLR-like' handling experience is the use of a damped rotating ring around the base of the lens barrel for manual focus. Unlike the A2, however, the A200's EVF is not really high enough resolution to accurately assess focus by eye. Still, it's a nice touch and one I'm glad they kept. 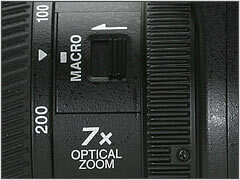 In this shot you can also see the macro mode slider switch, which only operates at the extremes of the zoom range. 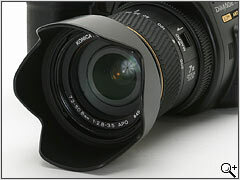 As with previous models the A200 is supplied with a clip-on lens hood. It does cut down on flare (which this lens suffers from at the wide end of the zoom), but it has to be removed in order to use the built-in flash at wideangle; otherwise it blocks the light. 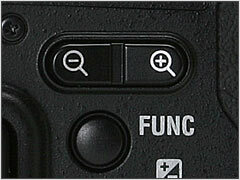 The new FUNC button (directly below the digital zoom buttons) replaces the second control dial found on the A2. It works very much like the Canon version, offering fairly quick and easy access to settings such as ISO, flash mode, image parameters and metering pattern. Despite losing the info LCD panel, the A200's top plate is still pretty busy - it's now home to the main power (on/off) and mode switches, as well as the self-timer/drive button. The mode dial has moved over to the left and is now a lot less likely to be accidentally moved. 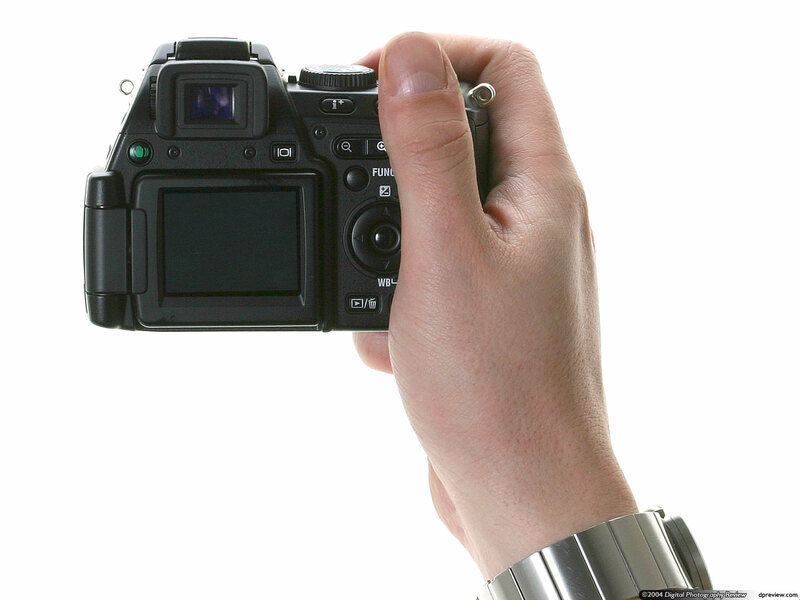 There is still a control dial behind the shutter release, but the second dial above the thumb rest has been removed (most of its functionality having been replaced by a 'SHIFT' button).